Stable and safe transport starts with effective palletisation. 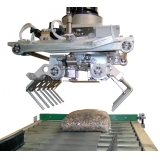 That's why Tallpack International offers reliable palletising systems, with its own specialisations concerning capacity and product handling: a robot system and a layer or sliding plate palletiser. The systems are available in semi-automatic to multi-loader versions, and are suitable for high capacities for e.g. trays, boxes or bagged goods. This allows Tallpack International to design tailor-made solutions for many industries. Naturally, each palletiser will be designed and constructed in accordance with current safety norms. The systems are often modular, which means they can be easily expanded or modified at a later time. For example, if there is an increase in capacity or if changes are made to the production system. The machines are user-friendly and do not interrupt the production process. For instance, the control panel features a touch screen that shows the palletiser in graphic form. This clearly shows the operator which part of the machine is active or is being operated. This makes it very easy to input new stacking patterns. In addition, messages and malfunctions are clearly and immediately displayed in a traceable manner. 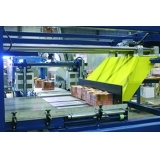 The robot palletisers of Tallpack International are extremely flexible and can be used to palletise items including trays, bagged goods, boxes, buckets and bundles. The slide rail pushes the supplied products together until a row or layer in the desired pattern is realised.